Union members plan to be back at their jobs at the Bronx complex on Thursday morning. 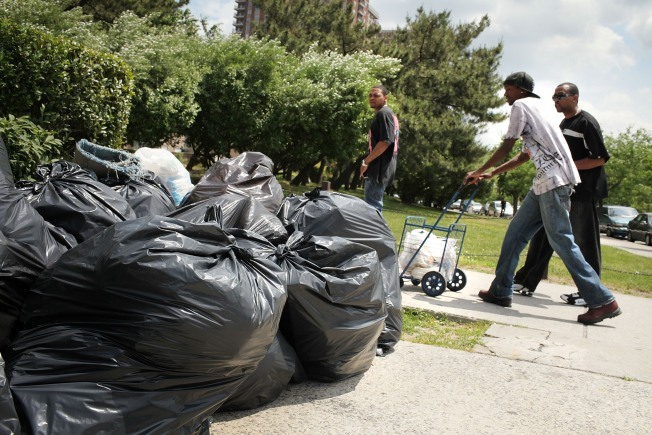 Residents walk by mounting piles of garbage at Co-op City where workers walked out on June 1, 2010 in the Bronx. Hundreds of workers are returning this week to Co-op City, the nation's largest cooperative housing complex, where about 40 tons of garbage had been piling up each day during a contract dispute. Co-op City management and the union representing about 500 workers agreed Tuesday to resume negotiations. Union members plan to be back at their jobs at the Bronx complex on Thursday morning. The crisis started early last week when the contract expired between RiverBay Corp. and the union representing garbage collectors, janitors, repairmen, groundskeepers and other building workers. City sanitation workers sprang into action Friday after officials declared uncollected garbage at Co-op City a health hazard. The 320-acre site has almost 60,000 residents. "On the one-week anniversary of the Co-op City lockout, I am pleased to announce that RiverBay has accepted the union's offer to return to work and resume contract negotiations," said Kyle Bragg, vice president of Local 32BJ of the Service Employees International Union. Co-op City General Manager Vernon Cooper has called the labor dispute a strike or impasse, denying that management had locked out employees. Bragg said residents "deserve top quality service and maintenance not the mounting piles of garbage and reduced services that they've been forced to endure." The dispute is over wages and health care coverage. Union spokesman Matt Nerzig said the two sides are expected to resume talks sometime this week. "We are very pleased to welcome back the 32BJ workers," Fred Winters, a RiverBay spokesman, said in a statement. "We hope that this will lead to substantive negotiations that will resolve the outstanding issues and result in a new contract."